With his recent success at Red Bull Salzburg, head coach Marco Rose has drawn a lot of interest lately. In particular, the German media links him quite often with Bundesliga teams such as Schalke or Wolfsburg. Hoffenheim also seemed to be a serious contender, but ultimately decided to go with Alfred Schreuder. Rose, nonetheless, appears to be one of the most sought-after coaches right now. This head coach analysis will explain the reasons for this and show what makes Rose special. During his playing career, Rose played as left-back for VfB Leipzig, Hannover 96 and Mainz 05. In 2010, he started his coaching career as an assistant coach while simultaneously playing for Mainz’ second string. In the 2012/2013 season, he was the head coach of Lokomotive Leipzig in Germany’s fourth division. He managed to avoid relegation, which can be considered a successful season given the circumstances. After this short experience, he started at Red Bull Salzburg. From 2013 to 2017, he worked as a youth coach. The highlight was undoubtedly when they saw off Benfica to win the UEFA Youth League in 2017. The successful work with the younger sides led to his promotion to first-team coach at Red Bull Salzburg. In his first season, he won the Austrian league, reached the final of the Austrian cup and the semi-finals of the Europa League. Currently, it’s his second season with the first team. Rose’s assistant at Red Bull Salzburg, Rene Maric, shouldn’t be neglected, as they form a strong duo. Maric started his career writing tactical blogs with incredible analytical depth. Coaches like Thomas Tuchel were interested in the articles and began to consult the young analyst. When Rose also asked for Maric’s expertise, the relationship between the two intensified. Maric then asked whether Rose would be interested in working together and so their collaboration began. 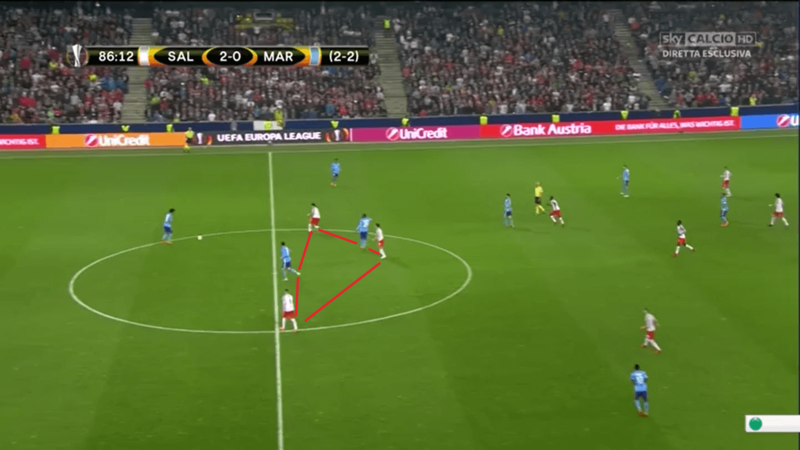 At Red Bull Salzburg, Rose implemented a 4-3-1-2 system with a diamond shape in the midfield. Just breaking it down to this is too simplified though. A month ago, assistant coach Maric tweeted that their “4-d-2 has 11 different variations out of possession,…, just in terms of base staggering.” With 4-d-2, the diamond-shaped midfield is described. In our analysis, we will show some of these variations of the formation. We will also show some of the benefits of this system like compactness in the centre, good passing angles and diagonal or vertical passing options. As mentioned, the midfield structure is fluid when the opponent is in possession of the ball. The back line is always a back four though. Most of the time, the aim is to close the centre and force the opponent to the wing. Here, we see a good example of this. The opponent has no chance to play the ball into the centre, as Salzburg have blocked it off. Furthermore, the pass into the half spaces is also not possible. The two strikers stay a bit more broad to prevent passes into their area. When Leipzig play the ball into the left half space, the right central midfielder of Salzburg, Amadou Haidara, moves out aggressively to pressure the opponent. The resulting midfield shape appears odd, but fulfils its aim. Leipzig have to turn back and have no chance of gaining space. Also, if the opponent makes a mistake, Leipzig may win the ball in a dangerous area with a high probability of scoring a goal. Most of the time though, the midfield diamond maintains its shape and the differences in staggering are small. Here we see Haidara again putting pressure on the ball, but this time it’s not that extreme. While in the previous image he was at the same height as the two strikers, he stays in his position here. The left central midfielder stays a bit lower though, resulting in an asymmetrical diamond. This is needed to prevent dangerous passes into the centre. 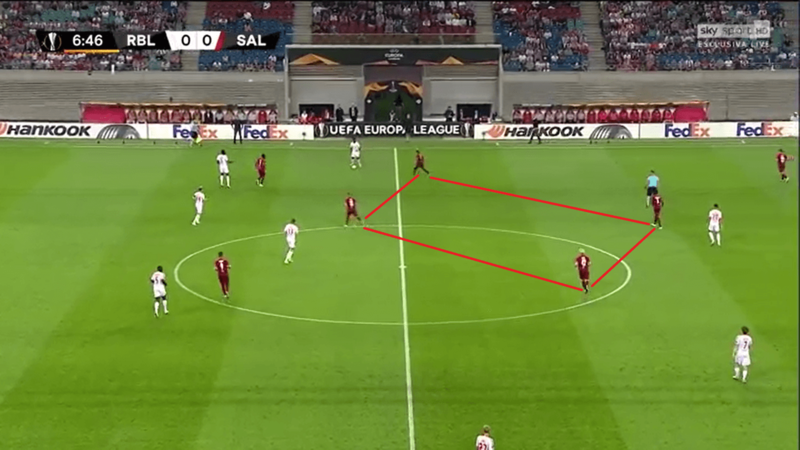 When Salzburg defend deep, the diamond shape can be replaced by formations that provide more width. Thus, there are situations where Salzburg would change to a 4-1-4-1 or 4-4-2 shape. In this image, we see a 4-1-4-1 formation with two low blocks and a defensive midfielder between the lines. Notice that the left midfielder doesn’t shift towards the centre, but instead remains on the wing at the blind side. If the opponent wanted to change the wing, this would be particularly difficult then. Nonetheless, the centre is narrow and tight, so it’s difficult to break through. Also, a 4-4-2 shape is possible, as we see in this image. The two strikers are also staggered in order to make passes into the centre more difficult. The midfield line is also not in one line, so a lot of space is covered. For the attacking team, it seems impossible to get between the lines and create a dangerous attack. The main plan, however, remains to push to the opponent to the wings. Most of the time, the opponent’s central midfielder are tightly marked. The opponent is forced to play the ball to the full back. Notice how both the ball-near striker and right central midfielder of Salzburg are already making the run to the wing to pressure the opponent’s full back, even though the pass isn’t played yet. When the full back receives the ball, Salzburg are in a good position to win the ball. With good use of cover shadows, passes into the centre aren’t possible at all. Other passing options are tightly man-marked, so the full back receiving the ball has no option of solving the situation. Additionally to these tactical aspects, Salzburg can be very aggressive which makes it even more difficult to withstand the pressure. 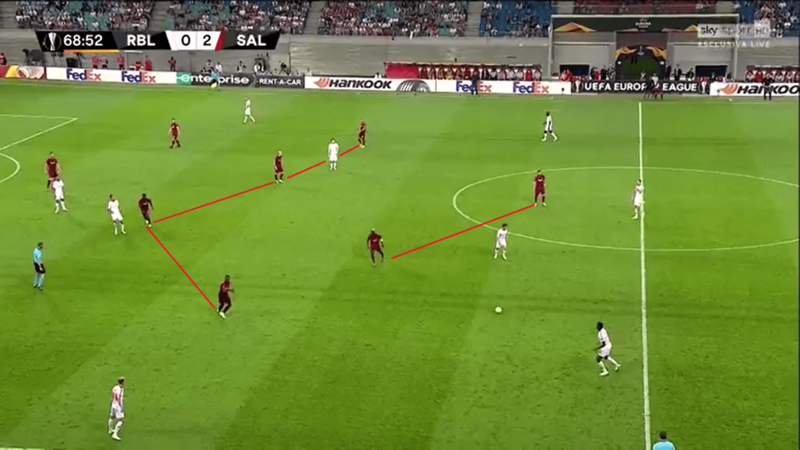 When the opponent is pushed to the wings, Salzburg also manage to create numerical superiority near the ball. Here, we have a five against two situation. Moreover, it’s remarkable that the press is still so intense and intelligent at the same time concerning that it’s the 113th minute of the game. The use of the cover shadow to prevent the pass back is just great. Here, we see the opponent coming into the final third through the wing. In this case, the player nearest to the ball of each defensive line moves out to the wing. The remaining players stay in the centre, opening gaps within the defensives lines. The movement is well coordinated through and the opponent can’t exploit the gaps. In terms of offence, Marco Rose’s team follows clear patterns. First of all, the full backs are extremely offensive and bomb down the wing. Their task is to provide width. The two strikers position between two defenders each in order to bind four opponents with two players. The number 10 occupies the space between the lines, while the other midfielders create a triangle. Also, Salzburg try to occupy the position in between two opponents. Thus, the same idea that applies for the two strikers binding four defenders is used for every player. Additionally, staying a few metres behind the two opposing players may also help, as the defenders can’t constantly keep an eye on the ball and the player at the same time. This slows them down mentally. 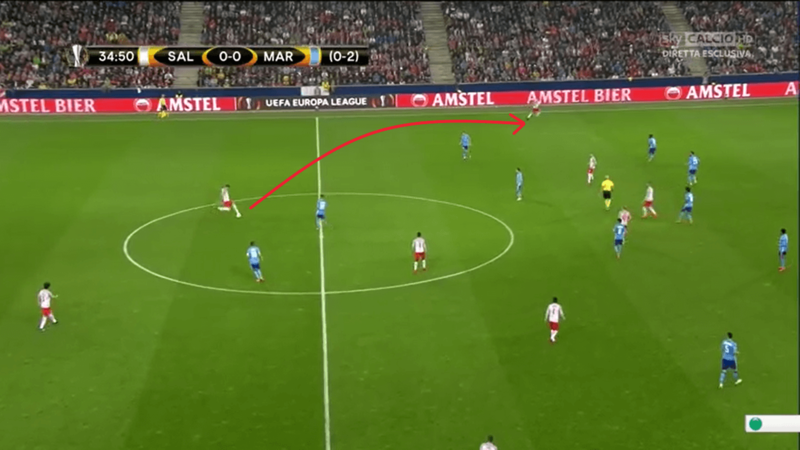 A clear example for this is the left back of Salzburg, who binds both the right back and right winger of the opponent. Both defenders have an eye on the ball and have their body positioned towards it. 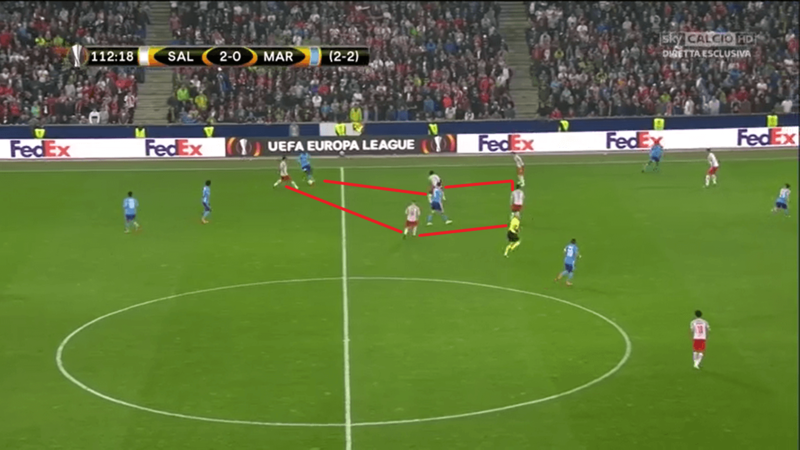 A similar problem arises for the other defenders with many Salzburg players positioning that way. 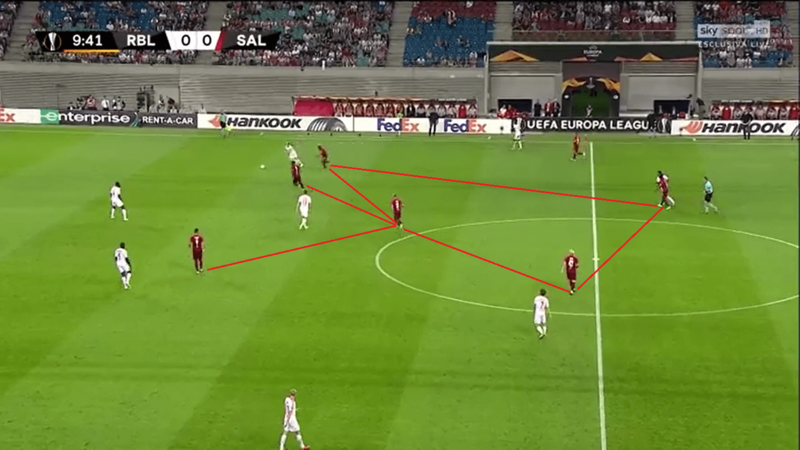 Apart from that, Salzburg also try to attract the opponent to one wing and then use the other wing to attack. Here, the attack starts on the left wing, but the blind side is wide open, so the right-back joins the attack and can easily receive the ball in the half space. Salzburg like to use the half spaces. Attacking from there has multiple advantages. One of these advantages is the possibility of creating good passing angles towards the centre. Here, Salzburg attract the opponent once again to the wing. The full-back then plays the ball into the half space, where the Salzburg player has a perfect sight and can clearly assess the situation. He then plays the ball into the centre, where the receiver can lay the ball off with one touch to the player nearby. As the pass into the centre isn’t possible immediately, one possibility is to switch the play to the other half space. We see that the player in the left half-space has a lot of free space to exploit. He then has better chances of getting the ball to the players between the lines. In terms of getting into the final third, vertically and diagonality are important for Salzburg. Vertical passes serve the purpose of gaining space and getting forward near the opponent’s target. They can be difficult to play through when the receiver can’t turn with the ball and has an opponent in his back. Salzburg thus play vertical passes only when the receiver can turn and has a lot of space to exploit. In such a situation like in this image, a vertical pass is fantastic as the receiver gets between the midfield line and can attack the defensive line after his turn. He then attacks from the half space and has a good sight. So the probability of a good continuation is high. One can’t rely on the opponent to leave so much space though. If there isn’t enough space to turn and the receiver has an opponent on his back, the continuation of the attack is often difficult. The receiver has his sight towards the own target and can’t properly assess the options in the final third. His only option is a lay-off. Additionally, the opponent doesn’t have to shift when a vertical ball is played, so it’s easier to attack the lay-off. Therefore, a diagonal pass can be an improvement, as it solves these problems. Here, a diagonal pass is played from the wing to the centre. Notice that the receiver can easily continue the attack. He doesn’t have to adjust his speed, nor does he have to assess a new situation. He sees the movement of the strikers and can get the ball to them eventually. Even though this is just one example, Salzburg provide a ton of situations like these. In terms of diagonality, Marco Rose’s side may be one of the best teams in the world. 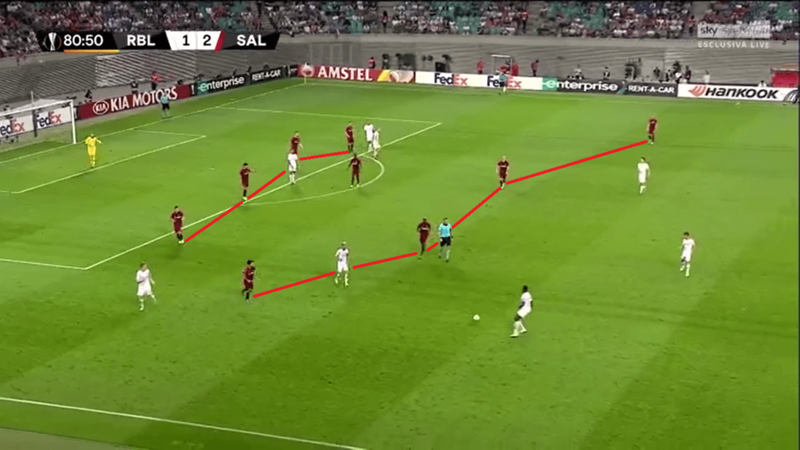 With the full back bombing down the wing, longer (high) diagonal passes like this one are also in Salzburg’s repertoire. They serve a similar purpose and make Salzburg an extremely dangerous side. In terms of offensive and defensive transitions, it’s for sure difficult to catch these moments with precise images. However, we should note that Salzburg’s transition game is strong. As their formation is particularly tight and compact, they can immediately put pressure on the ball after losing it. The so-called gegenpress starts therefore with their offensive shape, which allows them to prevent dangerous counterattacks. Concerning the offensive transition moments, the aspects of verticality and diagonality come into play here as well. Since the players have these principles implemented in their DNA, the movement when counterattacking is also great and helps them a lot. Besides the tactical aspects that we focused on, we should briefly mention Marco Rose’s leadership approach. Rose understands his role as someone, who creates authority by his competence as well as his beliefs. He emphasises that he wants his team to play football, be brave and be aware that they are Red Bull Salzburg. He then leaves a margin of error for every player, if the player is ready to learn from the mistake. Rose sees himself as a communicative coach, who doesn’t believe in strict hierarchies, but who still believes that every character should be treated individually. With this approach, he certainly has had a lot of success and created strong bonds with his players. Both his tactical skills and leadership qualities are important when it comes to defining Marco Rose the coach. The recent success he has had is no surprise. From a tactical standpoint, we showed the exceptional work he has done with his coaching staff. Salzburg are strong in every phase of the game, doing the basics really well. Thanks to many different variations, they are also able to constantly adjust their game to the given circumstances, which makes them a dangerous opponent for every team in the world. Rose’s communication skills and leadership qualities complete the picture of a potential top-class head coach. Even though it would be a huge loss for Red Bull Salzburg, Marco Rose leaving for a high-class European side could be interesting for European football. Previous articleHow did Schalke 04 fall down again against a solid RB Leipzig’s team?